Bird watching has long been a hobby of mine. 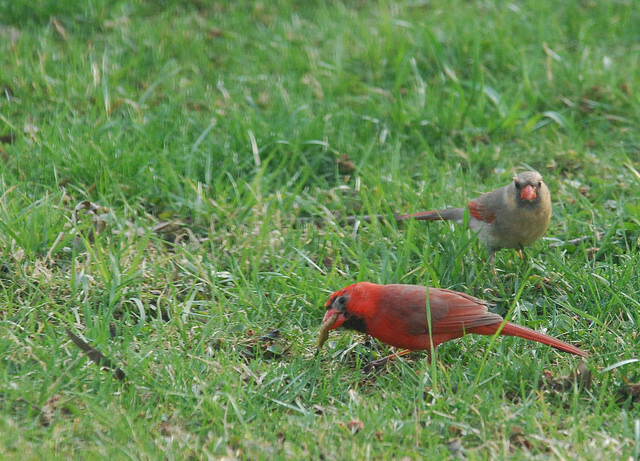 This pair of birds were in my backyard earlier this year. I believe they are a male and female Summer Tanager. Even before I was officially old at 50, I always enjoyed birding. When walking in the woods or hiking I would try to spot birds, especially unusual ones. Just this morning while walking the dog, I spotted two bluebirds, while not rare, an uncommon occurrence. In the same park, I have spotted ducks, quails and even an occasional blue heron. But hummingbirds have always been the bird I enjoy attracting in my backyard. There is just something about their ability to fly and hover that is fascinating. In Ohio, the most common one is the Ruby Throated Hummingbird — which usually comes back home from the South in mid-to-late April. …astonishing migrations have been found, with a Rufous hummingbird caught in Florida one winter showing up the following summer more than 3,500 miles away in southeast Alaska. Some birds have even been discovered wintering in areas where temperatures drop below zero degrees. Hummingbirds are a protected species and you need a permit to capture one. However, if you are interested in becoming a volunteer with the project Birds and Blooms has an interesting article explaining the ins and outs of banding hummingbirds. I am the 5x g-grandfaughter of Shadrach’s brother Peter Claywell and am trying to document the claim that Peter also fought at the Battle of Guilford Courthouse. I’ve searched the National, VA and NC Archives and they have not found records of Peter’s service. I would appreciate your contacting me if you have any information or can point me in a direction I have not as yet researched. Thank you. I will look through my notes and documents, but off the top of my head, I feel like I’ve read in a Shadrach document (possibly the investigation into his Revolutionary War Pension) — that Peter fought at Guilford Courthouse. Unfortunately I don’t. One thing I have come across in my research is — there seems to be several Peter and Shadrach Claywells. The Peter Claywell that I believe is brother to the Shadrach in my lineage is mentioned as a Revolutionary soldier in this article (and also in a book of Revolutionary Soldiers gravesites). When I was in Iredell County, NC, I came across some research on the Peter Clavell line (which is possibly Shadrach’s forefather)…here is a link to some of the research I uploaded. The research is from the early 1990s and was conducted by Charles Clayillie, Jr.
Hope this helps. If I come across anything else in my notes, I will pass it along. P.S. Sorry for the slow reply — I was ill.